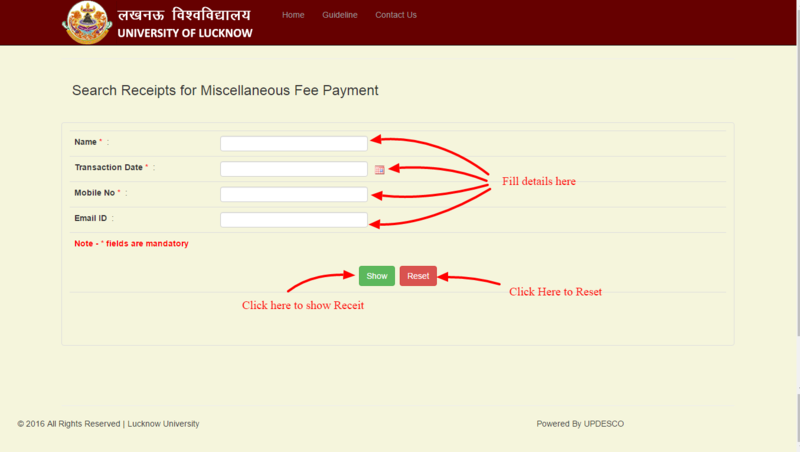 INSTRUCTIONS AND PROCEDURES FOR ON-LINE FEE PAYMENT OF LUCKNOW UNIVERSITY. Step1. 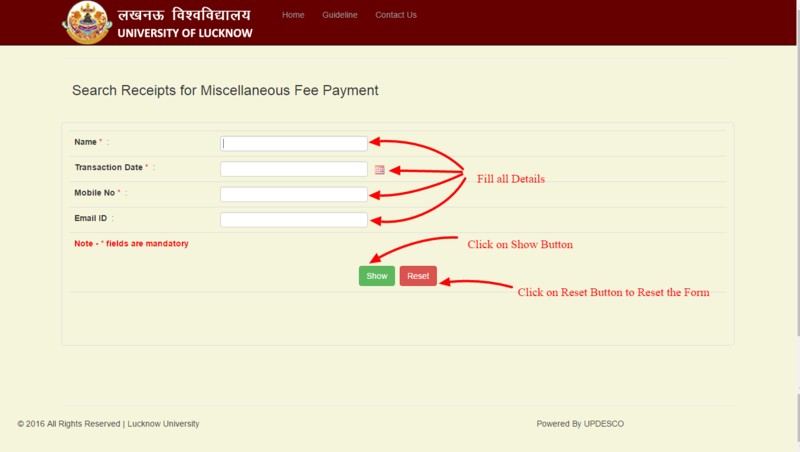 For Deposit Course Fee Online select Proceed Option. 1. 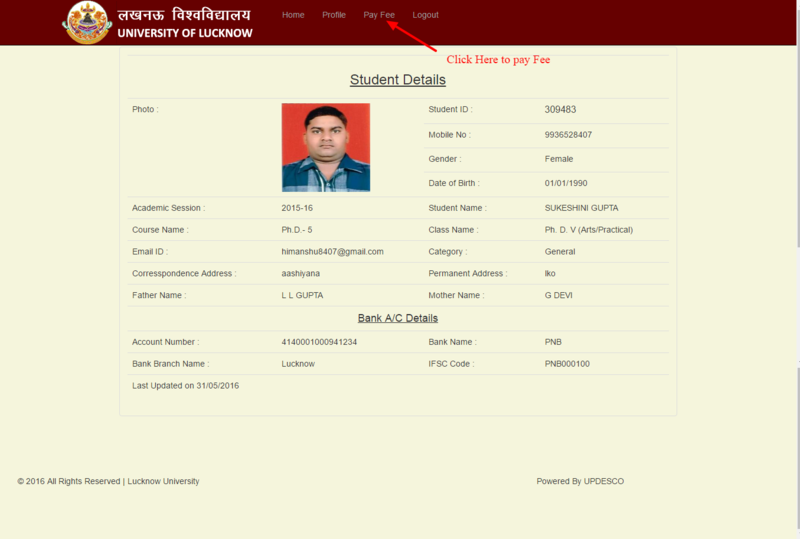 First Time User In This System : If You Are First Time Using This System To Deposit Course Fee Select This Option. 2. 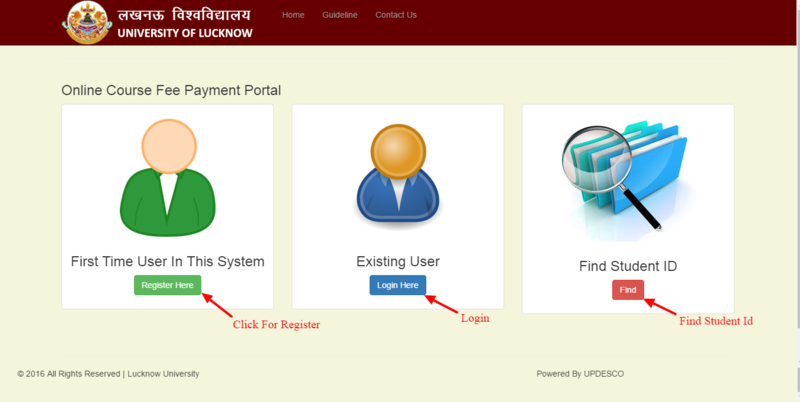 Existing User : IF You Have Already Registered In This System Choose This Option. 3. 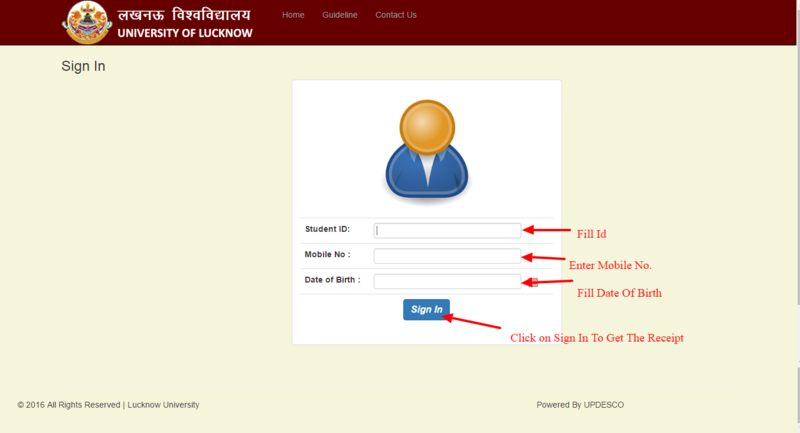 Find Student ID : : If You Don’t Know Your Student ID Choose This Option. Step3. when you click on Register here you redirect on this page,Now fill student id and student name then click on procced,if you dont know your student id click on Find Student Id. Step4. 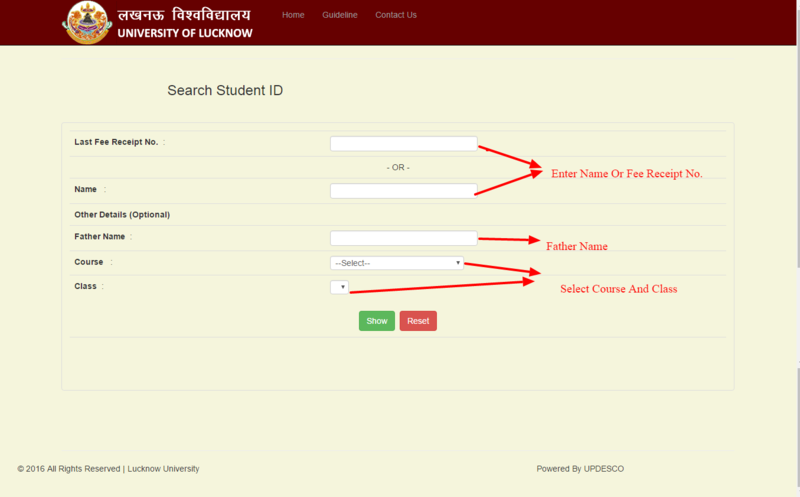 When you click on Find Student Id you are redirect on this page,After filling details click on show button if you want to reset click on reset button. Step5. When you click on Login Here ,you redirect on this page. Step6.Fill all the details here and click on Sign In Button. Step7. After Sign In you are Redirected on this page.Click on pay fee . Step8. Clik on view details or pay now . Step9. Choose yes or no . Step10.If you click on Yes Button you redirected on this page now you can select any payment mode Net Banking/Debit card/Credit card Or Pay Using NEFT. Step11. If you Choose one of these a popup will come.You should check button after reading terms and conditions. Step12.When You check on this button you will be able to pay fee ,Now you click on Pay Button. Step13.When you click on Pay Button ,You redirected On Bank Website . Step14.If You choose Pay Using Challan. Step15. If you Choose Pay using challan, click on Download Challan. Step16. Print Your Challan And Submit Your Fee . 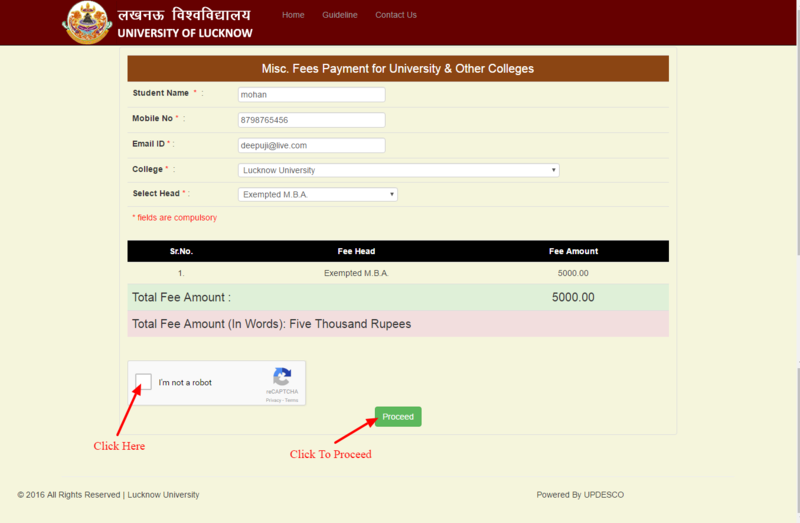 step1.Instructions For Filling Miscellaneous Fee For University And Associate College,Click on Proceed. Step2. After click on Proceed, you redirect to page and now you will select fee type. 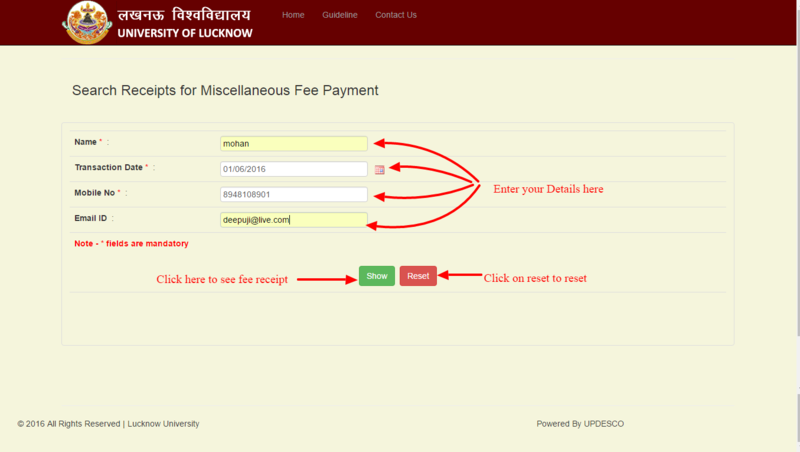 Step4.If You want to check Miscellaneous Fee Click on View Miscellaneous Fee. Step5.Fill all the required text and click on proceed button which show after selecting select Head. Step6.Tick On The box and click on proceed button. Step7. 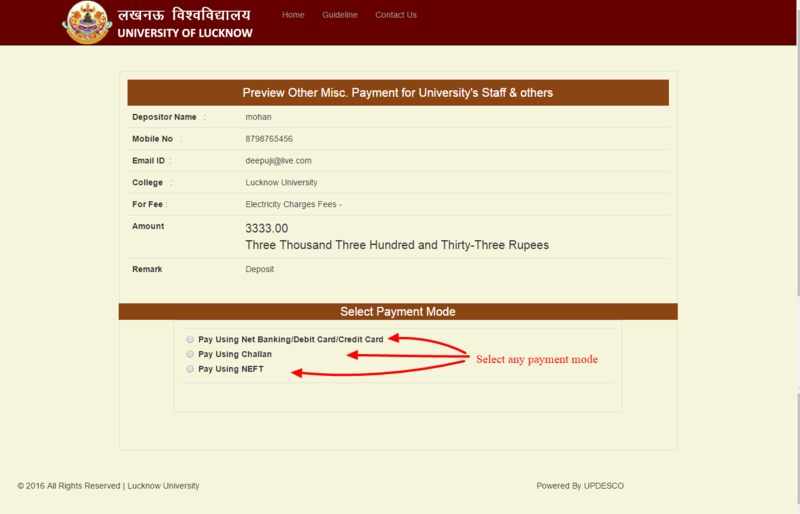 Select payment mode by which you want to pay fee. Step9. 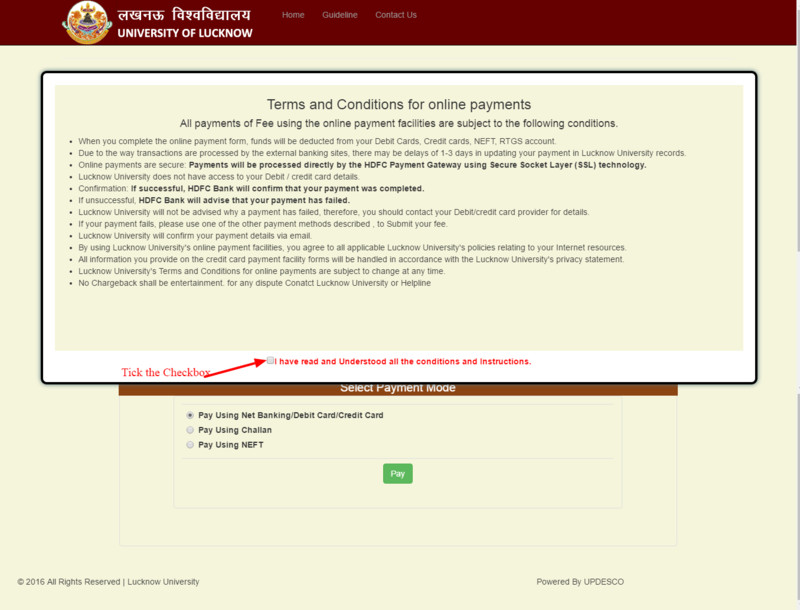 If You choose Net Banking/Debit card/Credit card Or Pay Using NEFT.You redirected to Bank website. Step10.If you choose Payment by challan mode above step will appear again. Tick the checkbox,After this Download Challan button appear click on Download Challan Button..
Step11.Download Challan button appear now click on Download Challan Button. Step12.Take Print of challan,Go to any HDFC Bank Branch to submit fee. Step13.If you want make a payment using NEFT follow Step10 to step12 using payment mode NEFT. 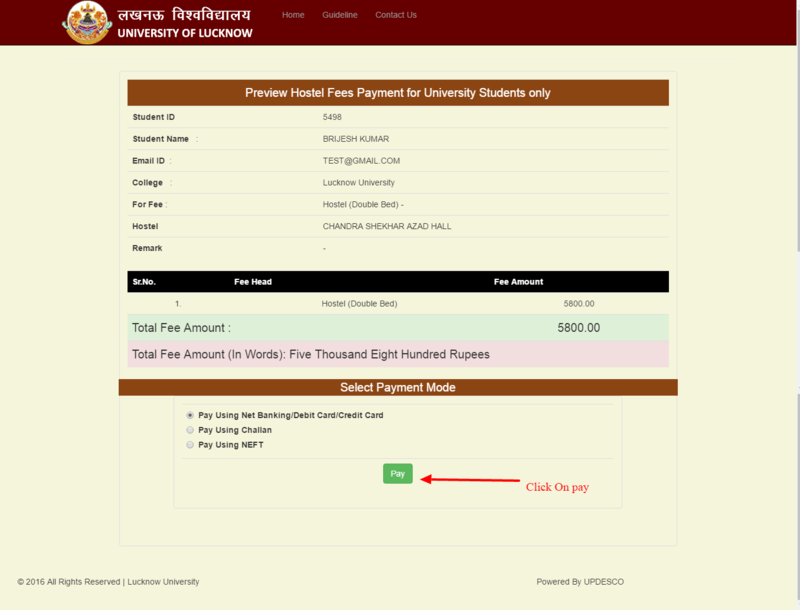 Guideline for Hostel Fee For University Student. 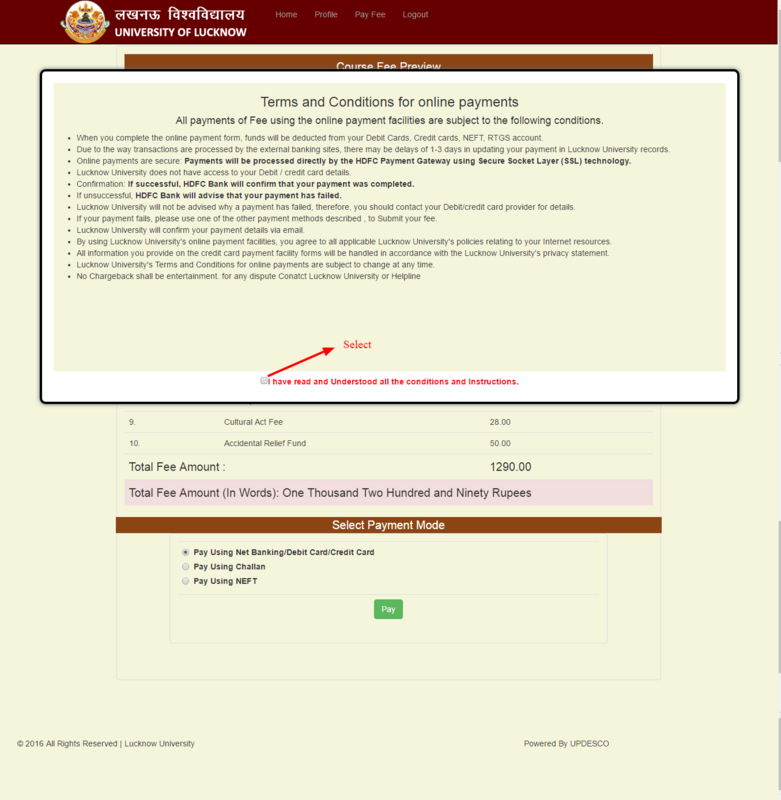 Step2.If you click on proceed button,Page is redirect to hostel fee payment page . 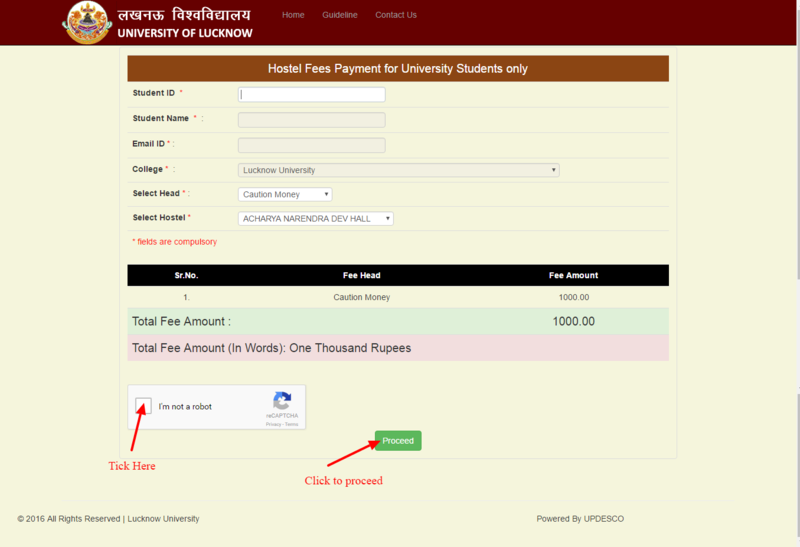 on selecting any value desired fee will appeare,After seeing fee Click on back to home button. Step4.If you Click on Re-Print Receipt. b.Click on show button to see your receipt. c.Click on Reset button to Reset the form. After Filling Form is appear as below,tick the checkbox and click On Proceed. Step6.Your page is redirect to select payment mode,You can choose any payment method. Step7.If you choose any one payment mode,popup will appear read terms and condition and Tick the checkbox. Step8.After that Pay Button appear on the page as shown below,Click on Pay . 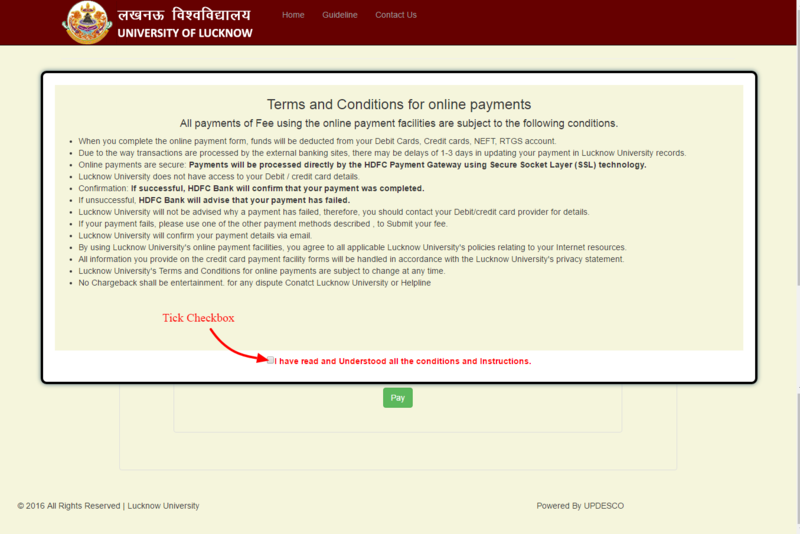 Step9.When you click on Pay Button ,You redirected On Bank Website. 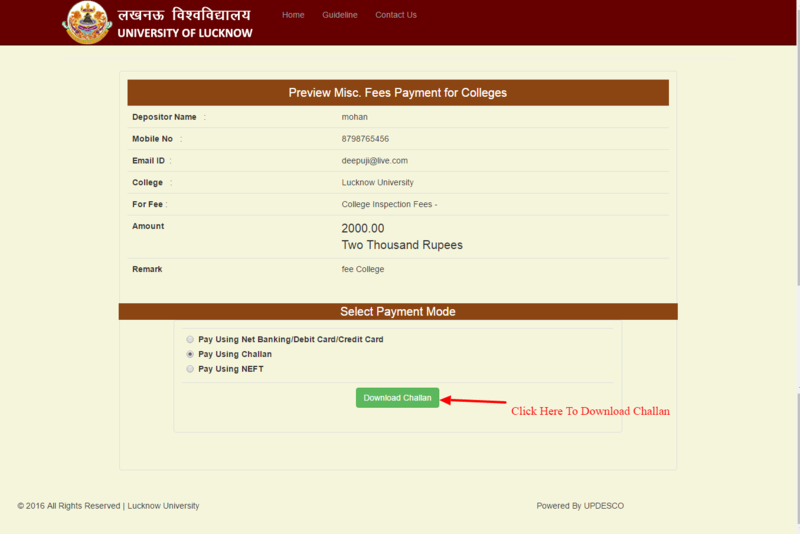 Step10.If you choose Payment by challan mode step will appear again. Tick the checkbox,After this Download Challan button appear click on Download Challan Button. Step11.Take Print of challan,Go to any HDFC Bank Branch to submit fee. 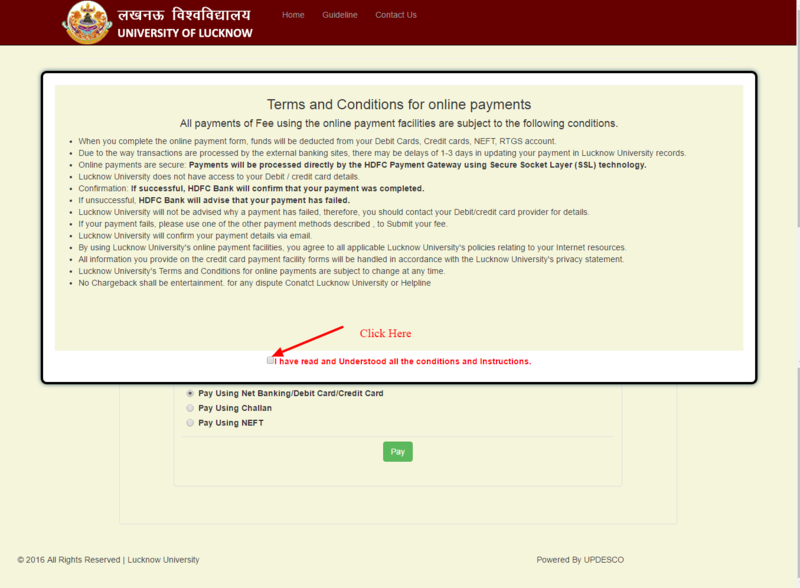 Step12.If you want make a payment using NEFT follow Step8 to step9 using payment mode NEFT. Guideline For Fine/Breakage/Late Etc For University Studentfor filling hostel fee. 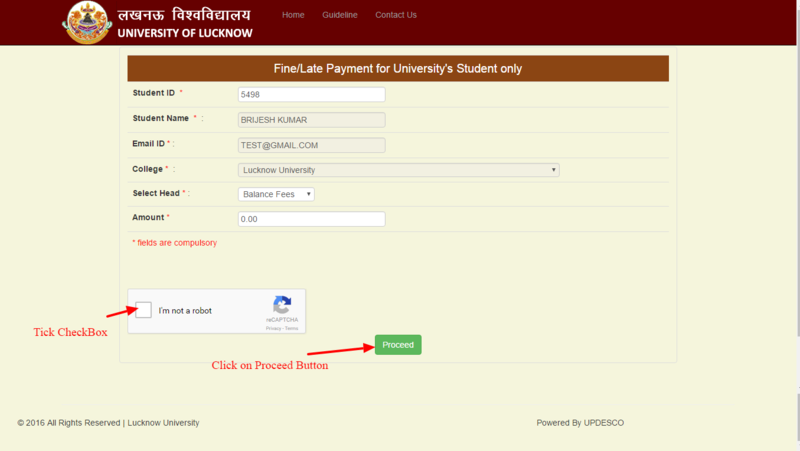 Step2.If you click on proceed button,Page is redirect to Fine/Late Payment for University's Student only page . Step3.If you Click on Re-Print Receipt. Pop up message appear Click Ok Button to proceed . 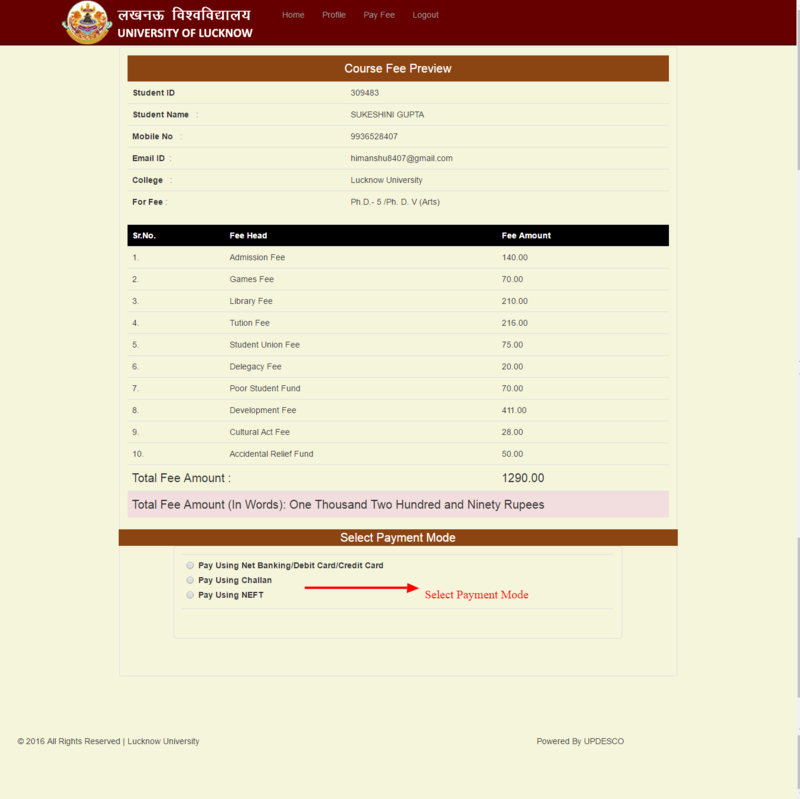 Step5.After Filling Form is appear as below,tick the checkbox and click On Proceed. 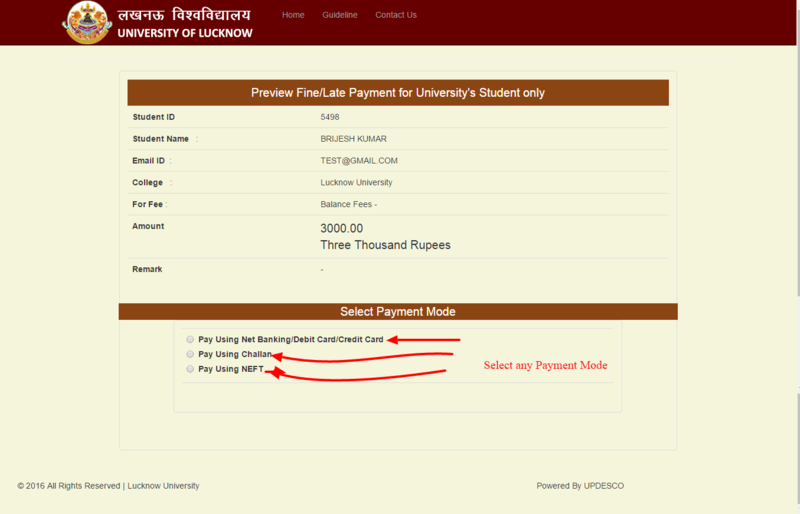 Step12.If you want make a payment using NEFT follow Step9 to step10 using payment mode NEFT. 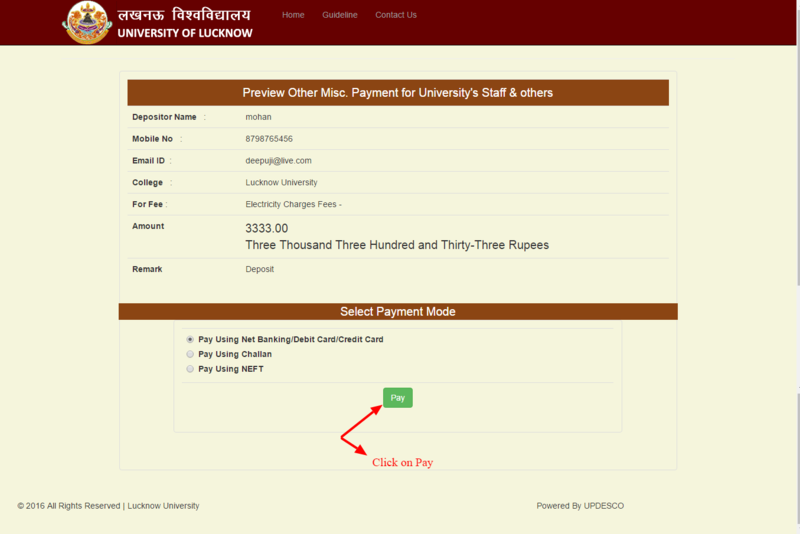 Guideline For Miscellaneous Payment For University Staff Electric Bill /Advance Etc. Step2.Now you can click on Proceed or Re-Print Receit . b. Click On proceed Button . Step5.Your page is redirect to select payment mode,You can choose any payment method. 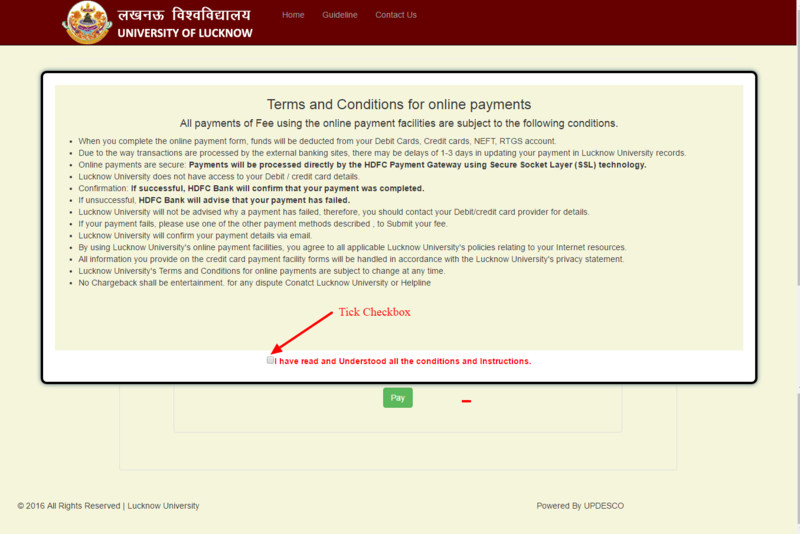 Step6.If you choose any one payment mode,popup will appear read terms and condition and Tick the checkbox. 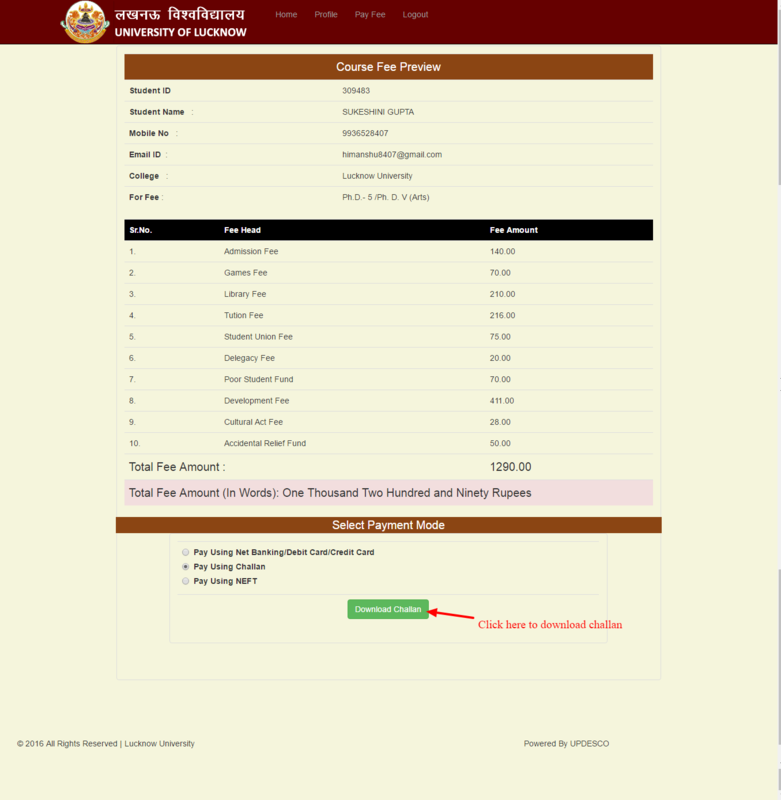 Step7.After that Pay Button appear on the page as shown below,Click on Pay. 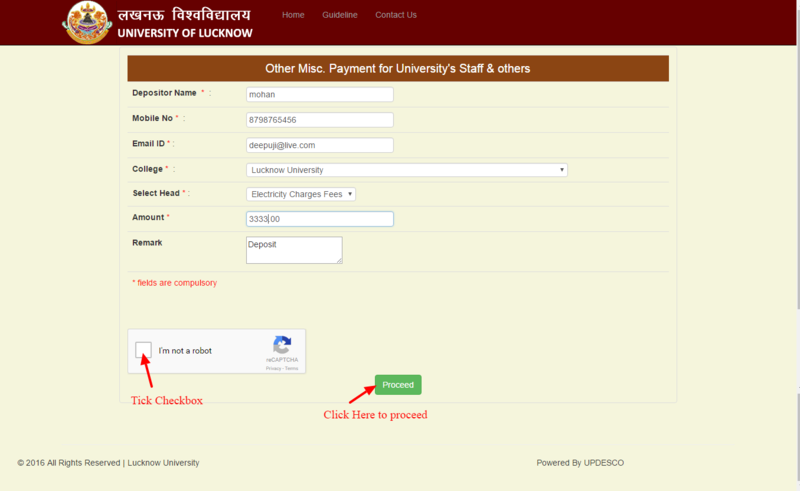 Step8.When you click on Pay Button ,You redirected On Bank Website now you can make payment. Step9.If you choose Payment by challan mode above step will appear again. Tick the checkbox,After this Download Challan button appear click on Download Challan Button..
Step10.Download Challan button appear now click on Download Challan Button. Step12.If you want make a payment using NEFT follow Step9 to step11 using payment mode NEFT. Guidelines for Associate Colleges Of University (Not For Students).